This stunning hard-to-find double styled bat features a mischievous grin. 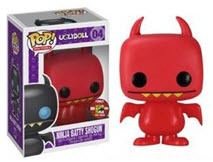 Ugly Dolls-NINJA Batty Shogun Pop!-Comic Con. Limited to only 480 pieces.